Few colleges the size of Redlands have such a wide range of academic programs — not to mention the levels of excellence. Redlands houses a chapter of Phi Theta Kappa, the largest Honors Society for two-year colleges. Undergraduates at Redlands get to be involved in conducting research. Plus, all classes are taught by the full professor: there are no graduate-student teachers. We want you to have a positive and productive college experience right from the start! You can use our convenient online scheduler to arrange a campus tour. Redlands welcomes many students who are the first in their family to pursue college, as well as students from around the world. Our staff is ready to help you throughout the process, sorting out any confusion about the process and any specific needs a student has. Student athletes are another special attribute of the Redlands experience that gives all of us a little something more to cheer about. Both women's and men's teams have enjoyed their share of success, and our programs continue to grow. Redlands is a unique place. Maybe that's why students feel so comfortable being themselves as students here: comfortable and confident pursuing their unique interests. Redlands students feel like they are on familiar footing — with the opportunity to go anywhere! 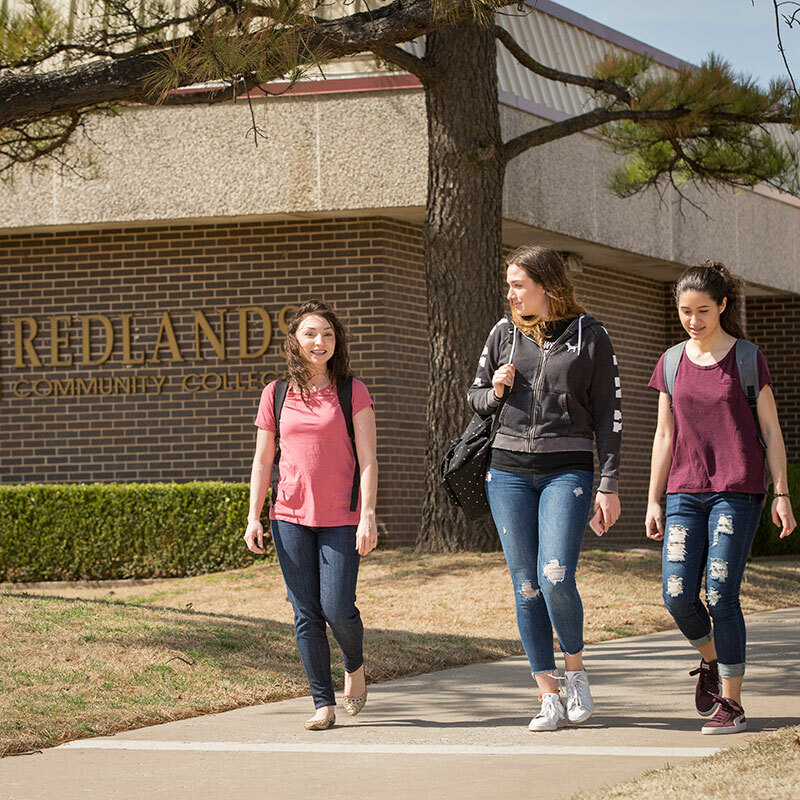 With programs from nursing to agricultural studies to the arts and sciences, Redlands students have gone on to excel across Oklahoma and beyond. College is a big step: take it any direction you want to go at Redlands! From offering high quality on-campus housing in our modern apartments to providing game-day excitement with our men's and women's teams, this is no ordinary two-year school. Our campus and our classes are sized right: you won't just be a face in the crowd at Redlands. Come and have the full college experience! A college education at Redlands costs less than the Oklahoma state average for public institutions (based on cost per credit hour). For students planning to attain a four-year degree, completing the first two at Redlands can save you thousands. Figuring out the process of paying for college can be intimidating, especially in households where parents haven't gone themselves. We make it easy. Program Description: The Associate in Arts in Psychology consists of a curriculum which provides learning experiences in early and contemporary theories of behavior such as: how individuals think, behave, and make decisions, relate to others, adjust to, and/or cope with stress, appreciate and value differences in individuals and groups, and understand themselves and others. Upon successful completion of the Associate's degree, a student will be able to seek an entry-level position in a human services agency and/or continue his or her education at a four-year institution. © 2008-2018 Redlands Community College. Site by MRW.